How do we create a positive school culture? Educators spend a lot of time thinking about this question, especially at the beginning of the school year when everyone is eager to start the year strong. Teachers work tirelessly to welcome their students, explain classroom rules, and establish routines all with the intention of creating a smooth and positive school year. However, teachers and administrators know that a key component in creating a positive school culture is to inspire students to understand that they are instrumental in creating such an environment themselves. 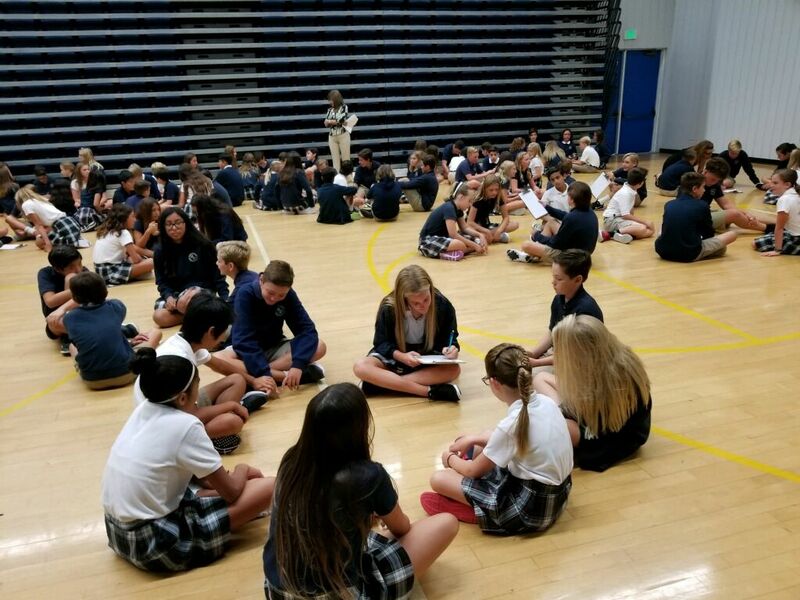 At the Upper School Morning Meeting on the first day of school, students in fifth through eighth grade met in the Moiso Family Activities Center in their family groupings to discuss how they can help create a positive school culture. 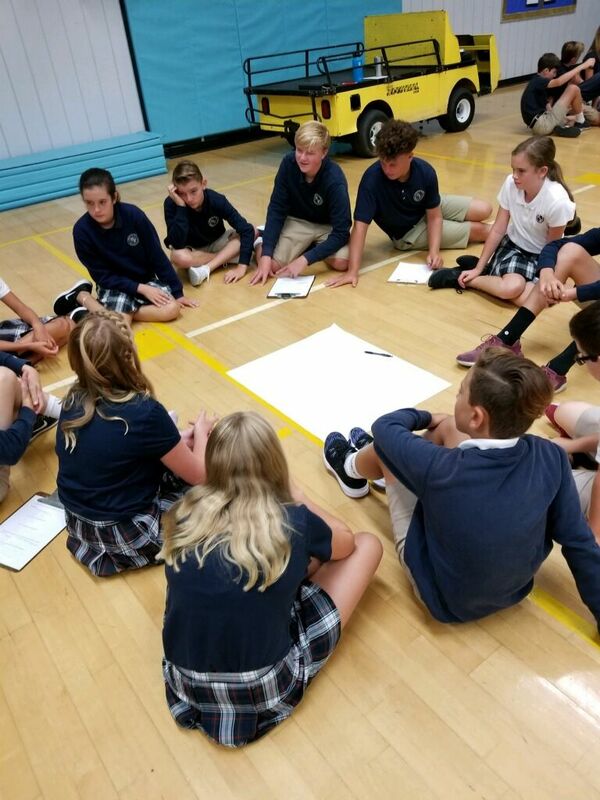 Eighth graders led the discussion and took notes as all groups explored: 1) what makes a good school, 2) what makes students feel good at school, and 3) what students can do to make a good school. Groups came up with five words to describe the school of which they wanted to be part. Words such as inclusive, supportive, clean, participatory, and welcoming were amongst the most popular. Next, groups identified three specific ways that each person could support creating this environment at Harbor Day School. Asking how others are feeling, listening while others are talking, and smiling while making eye-contact are just a few examples of small, everyday actions that students articulated what they can do to make a big difference in creating a positive school culture. 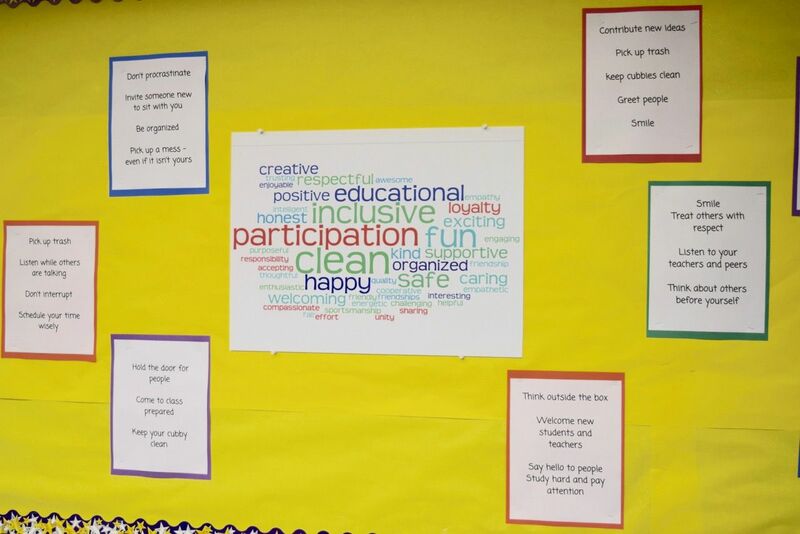 Mrs. Kelly created a word cloud of all the descriptive words that groups identified as to what makes a good school. It is on display on a bulletin board in the Open Space near the sixth and seventh grade cubbies. Additionally, all of the action items are posted to serve as a reminder to students that they all can contribute – and have the solutions – to create a healthy school culture. The goal is to foster these positive actions and feelings throughout the year so that students, faculty, and administrators will create the school environment that they desire. Upper School Students working in groups. The final product is a word cloud with all the students' positive words. About Mrs. Johnson: As the Director of Upper School, her administrative role includes overseeing the fifth through eighth grade classrooms and curriculum, managing Upper School admissions, and coordinating high school placements. Prior to her administrative position, Mrs. Johnson served as the Upper School Language Arts Department Chair and taught Upper School English and literature for four years. She also taught world history and geography for five years. Mrs. Johnson holds a bachelor’s degree from Vanderbilt University, a master’s degree in education from Harvard Graduate School of Education, and a juris doctor from Chapman University School of Law.